The main inspirations for the interior design were Palm Springs modernism and David Hockney's painting A Bigger Splash, which lent the space its burnt-orange walls and pastel accents. An interior window looks into the building's concrete core when the hallway lights are switched on. The ripple pattern of the Italian laminate tables is meant to recall the surface of a swimming pool, while the banquettes are upholstered in Kvadrat fabric in Bazooka pink. The restaurant features a special edition of the Houdini chair by Stefan Diez for e15 which tuck underneath a stainless-steel bar at the open kitchen. Large windows give passersby on the Ritterstrasse a view into the open kitchen. Along with a dessert display at the end of the bar and a signature pastrami recipe, the resturant features another New York deli staple: an autographed photo of the Seinfeld cast. What do David Hockney's paintings of West Coast scenes have to do with Seinfeld, the quintessential New York City sitcom? They're both among the bicoastal influences behind Louis Pretty, the new restaurant in Berlin's Kreuzberg district that's bringing a modern take on Jewish-American food to the German capital. To create the space, Oskar Melzer and bothers James and David Ardinast drew from a wide range of American influences, even importing New York chef Joey Pasarella to run the kitchen. For the interiors, they turned to Philipp Mainzer of Philipp Mainzer Office for Architecture and Design, who designed the space with Paul Bauer and Melzer. 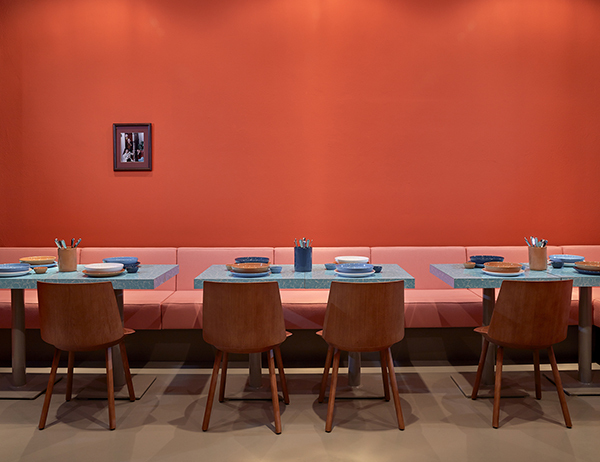 The result is a space that blends vibrant color and custom furniture—all served with a side of schmaltz.